I attended a couple of terrible conference sessions recently. The topic of interest was higher education uses of Second Life. Before I get into the SL portion of this rant, let me start with another pet peeve. One presenter introduced herself and immediately followed with “By the way, I hate PowerPoint, but it’s the best way show something.” Translation: I don’t know whether it is the best way to “show something,” but it’s the only way I know how. She proceeded to use PPT in one of the classic examples of Death by PowerPoint with slides that were nothing more than her lecture notes (for her benefit, I assume) and a few poorly made screen shots of empty spaces in SL. Also within the first five minutes she said, and I quote, that she has “dabbled in Second Life.” That’s exactly what I was hoping for – a one-hour presentation from somebody who has dabbled with the topic at hand. Whatever possessed her 8 or 9 months earlier to make a conference proposal about using SL? Possessed does seem to be the proper term. She went to talk about how they were building a teaching and learning environment within SL. She said their goal was to create a place with a PG rating, to provide a safe place for the students to interact. She admitted that they had no safe guards in place, but that they would ban people if they caused trouble. She said they really haven’t had any trouble yet. I pointed out that griefers rarely hang around uninhabited spaces within SL. That’s just not much fun for them. I’m not positive that she knows what a griefer is. The whole topic of appropriate behavior was basically brushed aside. Regarding the monitoring of student behavior in SL, she said, “We don’t monitor them in first life, so why in Second Life?” Excuse me, but we do monitor them in FL when they are in our learning environments – we just don’t continue to monitor them (much) after they leave our campuses or networks. For the record, I’m not too concerned with monitoring student behaviors in SL either, but I am concerned when people just make inaccurate statements in order to not deal with the question at hand. There were two things of which she seemed particularly proud. They have built a classroom in the sky and another one underwater. “You can do whatever you want in this flying classroom,” although she gave no examples of what those things might be. “You can show your PowerPoint on the screen under water. Oh boy, that’s what we’ve been missing from a quality education. 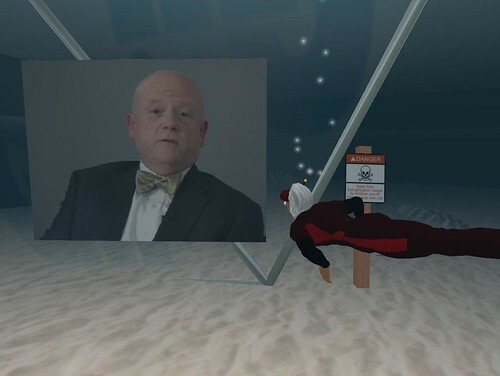 I’ll grant you that it sure would be more difficult to show your PPT under water in first life, so this sounds like a great opportunity for someone to show their underwater basket weaving slideshow while actually (OK, not actually, but virtually) under water. Yes, technology enables us to do fabulous things. I was troubled by the screen shots that never showed any avatars on their educational island. I asked how much the space was getting used. “I believe they are using it, but I’m not really sure. I’ll be using it this week for the first time myself.” At that point, 25 minutes into the presentation, I decided that I needed to leave the room before my head (especially my mouth) exploded. So, I did. I wish I could report out on the last 35 minutes, but right now all I’ve got is yada, yada, yada; blah, blah, blah. Along with a couple of lousy presentations, I also saw a good one. Here the presenters were actually using SL, including one presenter who was back in New York state and was presenting and commenting in world. Not only was it far more effective to use SL as the presentation platform, but we actually had presenters who knew what they were talking about, who have taught real live students in SL, and who can give some concrete examples of useful things that can be done in world. They admitted to some of the lame things that they had tried, and took credit for some of the cool things that they have created. If you’re looking for some of the good examples of how higher ed is using SL, take a look at SUNY Live or search in world for Monroe CC. This presentation was really quite outstanding. I’m with you…I get really annoyed by 1) people presenting on SL when they clearly haven’t spent any significant time using it; and 2) presentations on SL that don’t use SL. Powerpoint totally misses what is key about SL the ability to collaborate and interact and to use a 3D environment. Barry – I stuck it out. It took the presenter a bit of time to get to the point, which was to show the ANGEL Learning island that had recently been created. She acknowledged that she had not done a lot with Second Life, and others were building the site, but she wanted to show what was in development. She was looking for suggestions on what the participants might like to see on the island. There were a few cool things, but most needed some work. I think they are looking to build a landing zone with many portals to good educational islands. Although, there wasn’t much of that content built yet. Probably worth investigating again later. Barry, what conference was this, Educause? Because I was there too! I no longer blame presenters for a poor performance. People are entitled to submit anything they feel is worthwhile. I hold the hosting organization responsible because they make the selections that we have to suffer through. My budget is limited. I only attend 1 conference per year and I expect a lot of “take away” for the money and time. The conferences over the past two years, both in Orlando, provided very little “take away”. I may just forgo travel next year, and stick to blogs, books, and articles.